The Detroit Connector provides transportation between Ann Arbor, Dearborn, and Detroit in support of curricular, co-curricular, research, service-learning, and other community-engaged opportunities. The Connector also facilitates cultural enrichment, enabling residents of Southeastern Michigan to better utilize the region’s rich arts and scholarly resources. The service is available to U-M faculty, staff, and students, as well as the general public. If you have questions, email reservations@detroitconnector.com or call (517) 333-0400. Emails are generally responded to within 24 hours. If the Connector bus is significantly late or does not arrive, call (517) 333-0400. The Detroit Connector schedule will remain the same for the Spring/Summer semesters. DETROIT CENTER PERMANENT LOCATION CHANGE -BEGINNING MONDAY, FEBRUARY 25TH. Due to ongoing construction on Parsons Avenue we have relocated our U of M Detroit Center stop to behind the DSO parking structure on the corner of Brainard and the service drive. Look for the sign. This move only affects our Detroit Center location and will begin for pick up and drop offs on and after Monday, February 25th. Riders can make an online reservation any time. If there is maintenance being done to the Detroit Connector bus, either an Indian Trails bus or one of our Michigan Flyer -Airride bus will drive the route as a replacement for the day. Search for and download the “Indian Trails Bus Tracker” from the iTunes App Store (iPhone) or Google Play (Android). Enter the code “connect” tap OK. Tap “Departure” and select your boarding point from the scrolling list (e.g., Ann Arbor Central Campus). Tap “Destination” and select from the scrolling list (e.g. Detroit Center). Tap “Time” and select your scheduled departure time. Near the bottom of the screen, select “Trip Status” to see the estimated time of arrival for your bus. At the bottom of the screen, select “Tap to show map” to see your Detroit Connector bus traveling on the road in real time! Zoom in on the bus to see it moving along its route. To return to the home screen, click the Indian Trails logo in the upper left corner. Tap “Website Link” to visit this site and find out more about Detroit Connector. Detroit: Free street parking is limited and paid street parking available nearby. Parking is also available at the DSO structure for $8.00 per day, or a $40.00 discount card good for up to 15 parking days within the same calendar month. Dearborn: Free parking is available at Fairlane Mall. Parking is also available at the U-M Dearborn Monteith parking structure for $0.50 per hour. Ann Arbor: public parking is available throughout the city. Stop located behind the DSO parking structure off of Parsons St. at the corner of Brainard St.
WHO CAN RIDE THE DETROIT CONNECTOR? University of Michigan faculty, staff, students, alumni, and the general public can ride the Detroit Connector. DOES THE BUS RUN EVERY DAY? The Connector runs seven days a week, Monday – Sunday; however, holidays and U-M seasonal closures may impact the schedule. Contact reservations@detroitconnector.com with questions about services on holidays and during seasonal closures. DOES THE SCHEDULE CHANGE IN THE SPRING/SUMMER? We are excited to announce that, this year, the Detroit Connector schedule will remain the same for the Spring/Summer semesters. We do recommend that you book your trip as early as possible, as this is subject to change. IS THERE A COST TO RIDE THE CONNECTOR? To best support our ridership base – including expanded times and service days – effective October 1st 2018, a cost of $6.00 is associated with each trip for all riders. 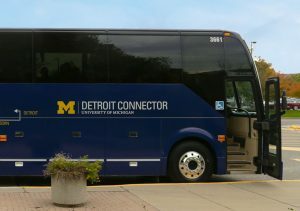 The U-M’s Detroit Connector bus service is funded in part by the Office of the Provost. In order to expand the service to a daily operation, a nominal fee was advised and approved by the Provost Office as a way to provide the most expansive coverage to the University community, while also making the University more accessible to the general public. This operation model was created to maintain a successfully sustainable service. Student groups volunteering in Detroit and faculty interested in taking classes to the city can apply for transportation grant funding by contacting Feodies Shipp at dini@umich.edu. DO I NEED TO MAKE A RESERVATION, OR HOW CAN I CHANGE MY RESERVATION? CAN THE BUS BE HELD IF I’M RUNNING LATE? No. Buses cannot be held at a stop beyond the scheduled departure time under any circumstance. Please remember to arrive at a stop at least 15 minutes before the scheduled departure time. Yes! You may bring your bike as long as there are designated storage spaces on the bus avilable. While we cannot guarantee that space will always be available, we can accommodate up to 8-10 bikes per trip. Bike-sharing services are also available in Ann Arbor, Dearborn, and Detroit. The Detroit Connector service is running as scheduled. Please note that the Detroit stop has relocated to behind the DSO parking structure as of February 25th.